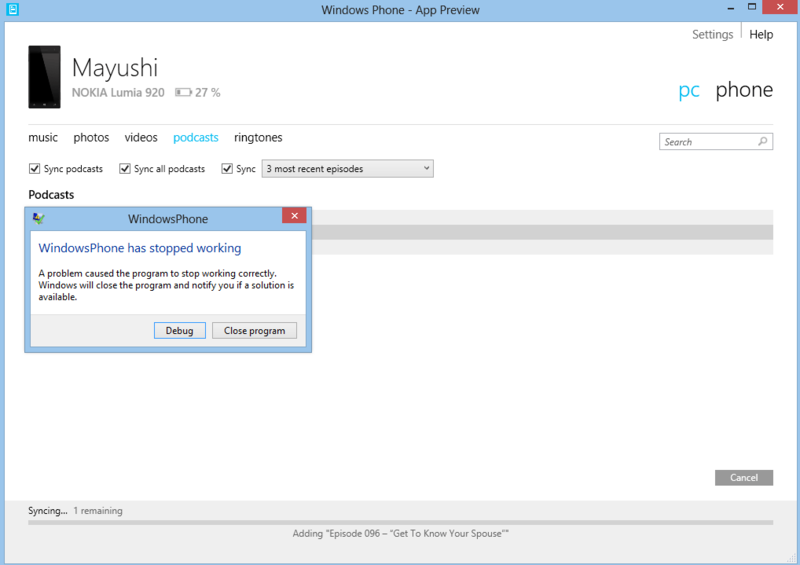 Since a few days, I had this annoying bug in the application used to sync my Windows Phone with my desktop computer: every time I tried to synchronize podcasts, the application just crashed. After a while, I decided it would be a nice debugging exercise to dig into the issue myself. 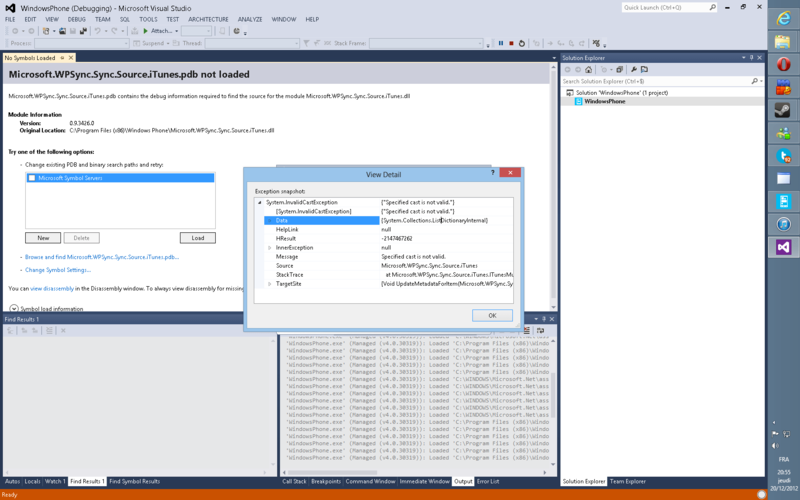 I suspected that the application was written in .NET (most Windows Phone related apps are), so I clicked on Debug and selected Visual Studio 2012. VS directly showed me that an InvalidCastException was the issue, and that the method was called in ITunesMusicSyncSource.GetLocationForReverseTransfer. Indeed, according to the signature, the “item.Properties.ObjectForKey” method returns an object. 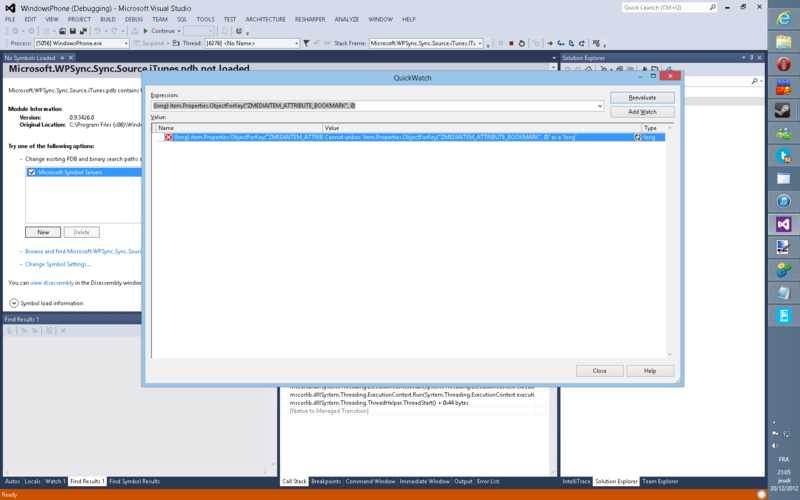 If the property is not found, the default value (passed as the second parameter) is returned. So in this case, if the ZMEDIAITEM_ATTRIBUTE_BOOKMARK property isn’t found, the value 0 is returned. Then, the return value is casted to long. Except that 0 is an int! A cast from int to long is valid, but we first need to unbox the value by explicitly casting it to long. That’s an easy-to-make mistake, so I’m not really surprised it wasn’t detected in the released product. Anyway, now that we know what the bug is, can we fix it? Sure. 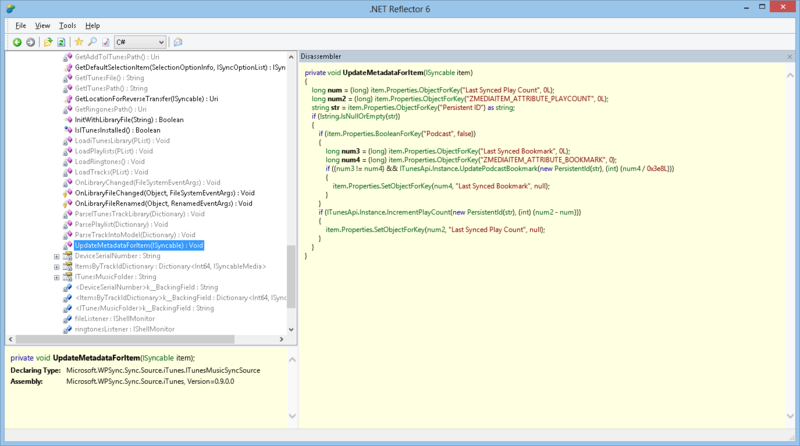 By using a Reflector add-in called ReflexIL, we can rewrite the bogus code. We don’t have the signature file, so we can’t possibly re-sign it. 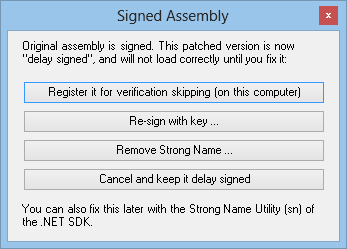 So I’ve just selected “Register it for verification skipping (on this computer)” to allows the .NET framework to load the unsigned assembly. Since I don’t intend to publish the file, it shouldn’t be a problem. 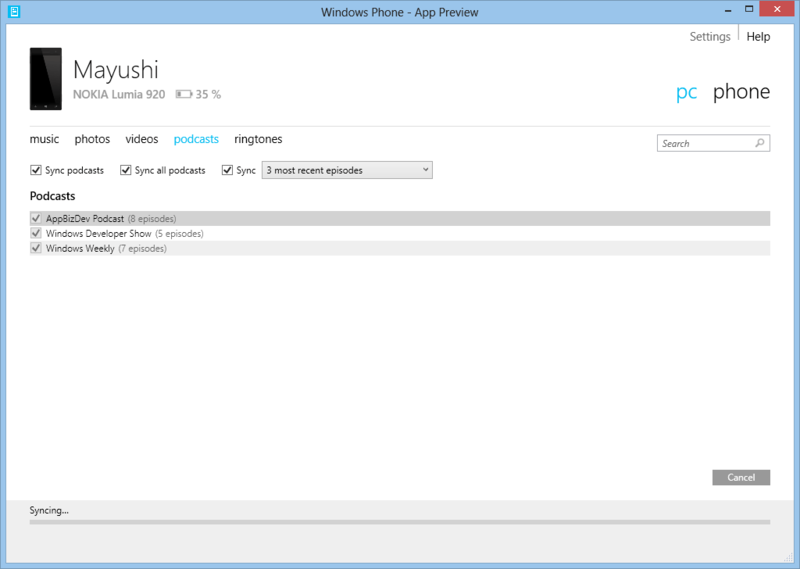 Now start the application again, try to sync the podcast, and… Sure enough, it works!